Waheeda Rehman plays this demure, meek Seeta in Neelkamal. She, after marrying her Ram comes face to face with reality when her Kaikai mother-in-law ensures to torture her in every possible way. The princess who was the cynosure of her father’s world, ends up being the house help and she succumbs to this royal torture quietly. Gayatri Inderjit from Sunny, the middle aged Waheeda isn’t the damsel in distress anymore but a scheming wife of a leading industrialist, who in order to keep the business and social status intact takes ruthless practical decisions. She does not succumb to nature’s harsh discourse but makes destiny follow her decisions. Rang De Basanti saw Waheeda as a well read and upwardly mobile widow of an army officer. She is modern in her approach and has willingly approved her army cadet son’s affair with a bohemian Delhi University girl. And when crisis knocks at her door again, she doesn’t succumb to ill fate but comes on road with the young blood. Staying relevant is one of the most crucial elements of hindi film industry and Waheeda Rehman is a living legend who has stayed relevant in every era since her debut in 1955 in Telugu and Tamil cinema. The industry is predominantly ruled by men, most of the leading ladies call it quits the moment they reach the motherhood roles. In such environment, Waheeda Rehman did not force leading lady role on herself, however she gracefully aged and took up relevant roles suiting her personality and grace. One would find it strange to see her playing the role of rebellious Rosy in Guide in 1965 and then essaying the role of Seeta in Neelkamal in 1968. Critics might have their eyebrow raising opinion on this, but it was a thought over decision from the talented actress. Rosy was not the ideal woman from the eyes of commoners and although the movie was a huge hit and eventually applauded worldwide, back home it had to face a lot of hardship. Playing the helpless, misfortune’s victim in Neelkamal helped her bring her back in audiences’ sympathy radar. People cried profusely when Rafi saab sang Babul Ki Duaaye Leti in the background and our loved leading lady was abused by her mother-in-law. That was a smart move! Although she is still remembered for her legendary performances in Pyaasa, Kaagaz Ke Phool, Teesri Kasam, Mujhe Jeene Do, Kohra, Chaudvi ka Chand and Guide to name a few. She is also remembered much respected for her key roles in second innings. Dilli 6 was not a box office hit, but songs are still super hit and when the grand silver haired dadi swags on Sasural Genda Phool along with her neighbours in terrace of traditional old Delhi set up, you can’t take your eyes off this beauty for sure. Even in 2018 although she played a wheel chair bound ailing mother to Kamal Hassan in Vishwaroopam II, with her expressions and gestures she is trying to remind her son of his wonderful dancing skills and its a visual treat. Waheeda Rehman has always reinvented herself as per audiences’ preferences. With her immortal beauty and exceptional dancing skills, she has wooed us in her glory of youth but has definitely not faded away in time. Instead with every decade she has made herself perfectly relevant as various characters who help in leading the story forward and stayed completely relevant. So while Waheeda Rehman continues to rock the silver screen and with her poise and class can give every current diva a run for their money, let us wish this grand lady of Hindi cinema a wonderful birthday. Wow! Quiet an analysis. Well written too. Good read. What an exhaustive review of the work of the olden day’s diva! Very well written and studied. Yes she is a diva n I have always appreciated her as an actor. Her role in rang de basanti was so so inspiring and strong. Very well written Kalpana. Keen to read Ur further blogs. Beautifully trailed her performance and yes the approach each era. Very thoughtful article. Written by someone who cares. Thoughtful analysis on the work of Waheeda Rehman. Well presented. 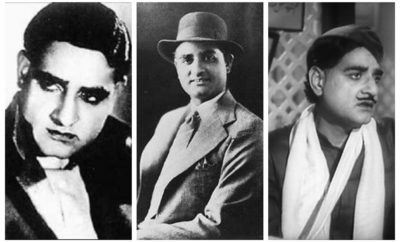 Pingback: Carnival of Blogs on Golden Era of Hindi Film Music, February, 2019 – The world is too small? or Is it?